Persephone, the bride of Hades, easily encompasses the purity of snow and the dark vines reaching for her, blooming in red. She carries her vulnerability and wounds with pride, drawing strength from her position as the compromise between life and death, the delicate balance of winter’s stillness and the promise of summer. The roses she carries, the roses she walks on are all reminders of warmth and growth, even in the midst of the coldest of seasons. This look works for both fantasy and elegance, it can be turned to a mythological figure or a stunning goth look for the wintry celebrations. Wear it and see if you dare to court the gaze of Hades. The dress and the gloves have colour-change HUDs of four colours: red, black, grey, rose. There’s also a HUD to change the hand positions of the gloves. The dress is a rigged mesh item that moves with your avatar. It comes in seven sizes: in addition to the five standard sizes there are also two extra ones: XS+ that provides more generous curves in the top part of base XS and M+ that has more muscles and extra curves than base M. The gloves are fitmesh and therefore come in just one size. The hair has a colour change HUD of 15 colours, especially selected to colour-coordinate with Persephone’s palette. It is unrigged mesh and therefore resizeable as you wish. The eyes and makeup set have four different eye colours and four coordinating makeups to match the eyes. The slippers are made for Slink high feet. The Slink feet are not included. The crown and slippers set has colour change HUDs of four colours to change the roses and ribbons to match your style. Please try the demos before purchasing. Originally released at Gothmas by Gaslight 2014, Persephone is now available both in the main store and the Marketplace. Permissions are M/C/NT. 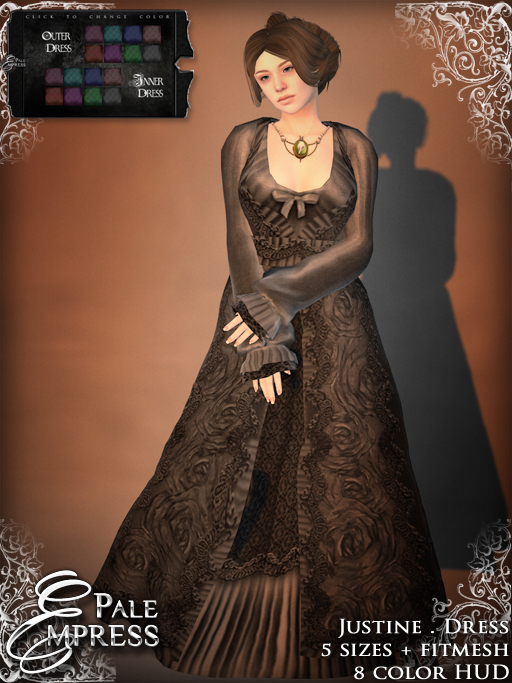 The dress and gloves L395, crown and slippers L295, hair L195, eyes and makeups L95. Justine consists of three separate pieces forming a complete look of dignified sadness: a dress, hair and a tattoo layer of tears. It’s designed for A Tattered Page, an in-store event that focuses in a book at a time. This round is concentrated on Mary Shelley’s Frankenstein. Justine — the young maid who is well beloved in Frankenstein’s family — is framed to appear as the murderer of William, Frankenstein’s youngest brother and the creature’s first victim. Despite the attempts to clear her name she is sentenced to death, thus being an indirect second victim of the creature. Both the dress and the hair come with colour change HUDs: the dress has an outer dress and underdress linked together, both have a HUD of eight colours and can be worn separately. The hair has a colour change HUD of 15 colours, covering all the natural tones. The tears makeup has streaked cheeks, red nose and undereye shadows. The dress is rigged mesh and moves with your avatar. It comes in the five standard sizes and the fitmesh version. The hair is unrigged mesh and therefore resizeable as you wish. The makeup is one tattoo layer. Please try the demos before purchasing. All three are exclusive to the event and won’t be sold with these colourways anymore after the event, so if you like them, you better get them while you still can! Permissions are M/C/NT. 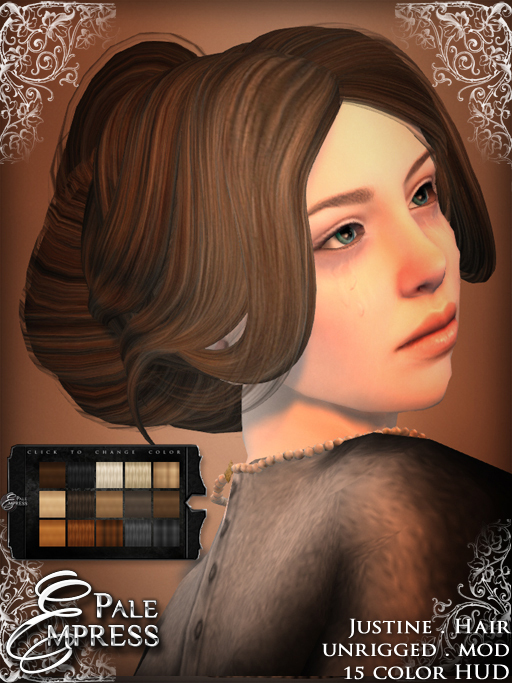 The dress L295, hair L195, tears L95.